NextThe 1,700 year old Roman and Byzantine-era mosaics of Lod. There has been an awakening! This phrase has been repeatedly exercised by fans and the media, over the past year to announce the return of Star Wars. Nothing it seems can stifle our excitement, not even the short comings of the prequels. I believe Star Wars: The Force Awakens will return the franchise back to the top where it belongs under the direction of J.J. Abrams. Abrams, is of course, the new kid on the block, when compared to its creator George Lucas, but he already has Star Wars fan so excited that I doubt that it will fail. Abrams has successfully helmed another sci-fi franchise, Star Trek (with film critics acclaim) and definitely has the know-how for drama, theatre and story-telling. One of the criticisms of George Lucas and the prequels is that when he made episodes 1 to 3, he was not the same filmmaker in the 90’s and early 2000’s, as he was when he made the originals in the late 70’s and early 80’s. Don’t get me wrong, George Lucas is a pop icon and did a great job with Star Wars: The Revenge of the Sith, but he let us down with episode 1 & 2. Handing over the reins of the Star Wars franchise is probably the best thing for its continued future and success. Lucas has every right to be worried that his vision for Star Wars may be compromised with the new trilogy ‘storyboarded’ by a new generation, but I don’t think he needs to worry. The Force Awakens I hope will return to the simple story telling or hero’s tale that made the original very much-loved. Lucas’ sloppy story telling and reliance on special effects in the prequels somewhat tarnished the Star Wars legacy, but I feel Abrams will return it to its core values. Abrams is a ‘fanboy’ and understands what Star Wars fans want to see. Personally I am also glad to see that Lawrence Kasdan was welcomed back into the fold again, writing along side with J.J. Abrams for this new chapter. Kasdan’s treatment of the screenplay in the Empire Strike Back was almost flawless and he is definitely a sight for sore eyes when its come to Star Wars! When I was growing up, Luke Skywalker was my hero in the Star Wars saga. I will never forget that first scene that introduced Luke Skywalker. It wasn’t dramatic, in fact, it was very mundane, as Luke’s aunt nagged him to make sure he told his uncle that they needed a protocol droid that spoke Bachi. But with every new scene that followed I began to realise that I was a lot like him. He did what was told of him, he did his chores, but dreamt of an exciting world beyond the desert dunes. As the story in ‘A New Hope’ began to take shape, I soon realized that Luke was the protagonist of the film, who would go on a hero’s journey of self-discovery and grand adventure. Wonderful, I thought! For a suburban kid like me growing up in the late 70’s and early 80’s, Star Wars was my release from the hardships of growing up in a migrant household. 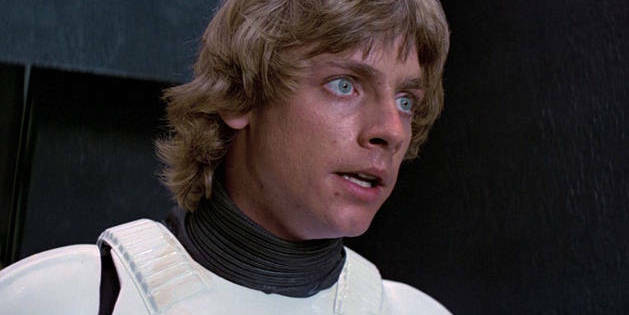 It sounds corny but when Luke Skywalker opened the detention level door to Princess Leia’s cell on the Death Star and said, “I’m Luke Skywalker. I’m here to rescue you,” metaphorically he was speaking to tens of thousands of fans worldwide, who wanted to escape with him on his hero’s journey. From humble beginnings as a reckless farm boy, we watched him mature into a Jedi, restore freedom to the galaxy and in the process save his father. How cool is that! “I’m Luke Skywalker. I’m here to rescue you!” Mark Hamill as fan favourite Luke Skywalker. With less than a fortnight to go before the release of this year’s most anticipated film, I wonder with a host of new characters, which one of them will become the new protagonist of the story? I’m hoping Jakku native Rey (played by actress Daisy Ridley) will become Star Wars new hero, a lot like Luke Skywalker was for the original trilogy. With that said, the re-emergence of a strong female character in the Star Wars universe would be truly welcomed. Carrie Fisher’s Princess Leia and Natalie Portman’s Padme Amidala were the first in the line of notable female characters; and in the expanded Star Wars universe, the Clone Wars and Rebels (animated series) favourite, Ahsoka Tano, lifted our expectations of what strong Star Wars female characters should be. With rumours that Daisy Ridley’s Rey is ‘force sensitive’, I certainly hope she is compassionate, smart and courageous like former Padawan apprentice Ahsoka Tano. There has been so much said and written about the new film that it is impossible to ignore all the rumours and hearsay. J.J. Abrams and Kathleen Kennedy’s new team at Disney have done an amazing job keeping things under wrap. They have teased us with several trailers that hint at everything but at the same time give us nothing. With the return of Mark Hamill, but the absence of Luke Skywalker in the trailer, it has given many fans heartache and reason for concern. With rumours of the heroic Luke Skywalker a villain, it is no wonder J.J. Abrams is keeping a tight lid on the film’s plot? The other sensational rumour involves yet another original trilogy character, possibly Han Solo or Chewbacca. All I can say is that if rumours are correct, we will be leaving the movie theatre in tears! If you are interested in reading more on spoilers and theories, fellow Star Wars enthusiast Master Awan, has a great series of articles on his blog. The Force Awakens promises fans and general movie-goers are real treat. There is so much more that can be said from the return of the original trilogy characters and the process Abrams hopes to install for the next two instalments to the casting of really exciting new characters, both heroes and villains. I will reserve my judgement of The Force Awakens in the weeks after its premiere. Though I am sure I will love it. Photo Credits: The header image is a cropped version of the Star Wars: The Force Awakens poster. The image is courtesy of Lucasfilm. The movie still of Luke Skywalker is also courtesy of Lucasfilm. I make use of both images under the rational of fair use to enable me to makes an important contribution to the reader’s understanding of the article, which could not practically be communicated by words alone. In fact, I hope that both together the images and article help promote the anticipation and excitement of the film. I am planning on sending a scout ahead of me to see the film and report on it so I know if I need to prepare myself emotionally before going to the theater. 🙂 But I am still quite excited for the new film! I really liked your description of how mundane Luke Skywalker’s initial introduction is. I had never thought of that before. I’m very excited for this movie now. Funny you mention leaving the cinema in tears, however; as I left the cinema in tears after Episode III, to be honest. I was emotional at a number of points in that movie, especially the final Anakin/Obi-Wan dialogue on the lava field.. The Nativity of Jesus in Byzantine art.